If you think you’ve played Tetris before, think again! Ponon brings new challenges (and advantages) to one of the world’s most famous games. Fit the glowing pieces to make full horizontal lines in order to disappear. Use the ghost guide on the bottom to fit certain pieces, and swipe it down to lock it in. Act quickly, because if you don’t do your job fast enough, extra curveballs will be thrown your way as you try to avoid letting your lines reach the top! Try to hold as long as you can! and get more points!By creating a horizontal line of blocks without gaps to get points, When the blue line reaches the right end, random amount of Ponon blocks will grow from the bottom. With every 2000 points get, the game enters into a new level with the gray block up faster and the new block fall faster. There are 240 carefully designed levels in 5 chapters with the increasing difficulty of levels, Ponon guarantees you will linger on our games while forget passing of the time.Remove the square to under the green safe line in limited time enables you to get more stars as well as to break your personal record! 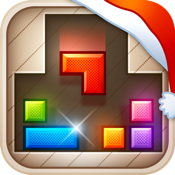 + 240 carefully designed levels in 5 chapters with increasing difficulty! + Exquisite game design and superb effects! + Super long time for gaming! + HD graphics optimized for iOS4 Retina Display! + Blocks with ghost power and infinite combos ! + Two operation of both virtual-key controlling and gesture controlling! + Built-in high scores and leader boards through Game Center! + Automatic saving of games for classic mode- always come back to the game where you left it last time! + a universal app for both iphone and iPad!